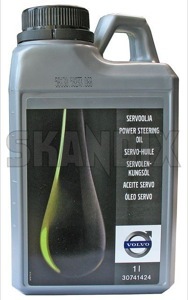 Volvo recommends the green oil (Skandix 1015964) for all hydraulic power steering systems. But we recommend to avoid mixing oil types at older vehicles (RWD Volvos and Volvo 850) which have red oil in the system. Replacing the whole red oil in the system with green oils is not recommended. Skandix 1060027 is an ATF-Oil which matches the old specification. In fact Skandix 1060027 can be used to replace or top up the old red oil.